An ideal gift for Frankenstein and his bride, the Lightning Alarm Clock awakes you every morn in the most unusual fashion. It’s more like a shocking experience where the hand blown glass tube (above the analog clock display) fitted with a mini Tesla coil that fills with electricity when the alarm sounds. The buzzing of electric charges wakes you from your slumber, while the clock tells you its time to wakey-wakey! 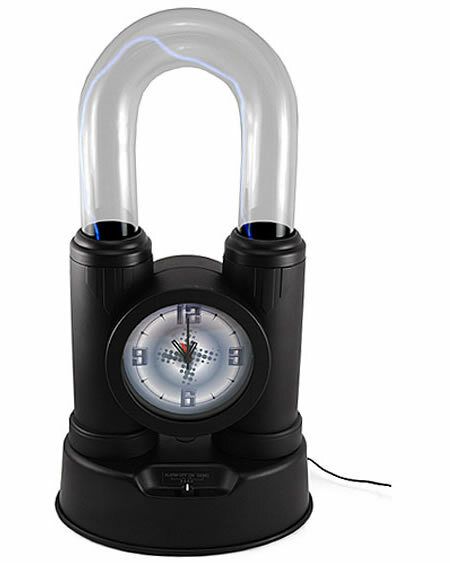 Essentially it’s a neo-classic alarm clock with white lightning effects that wake you to the sounds of light! The 14.5-inch Lightning Alarm Clock runs on a AA battery, its yours for $59.95.